The garden is still pretty dormant in January. There is not too much to do but to prune, plan, and pace hectically from the anticipation for the weather to warm up. When the pacing is not enough, the best part about January is that you can actually go outside and prune. The best time in the year to prune is dependent on the climate and plant characteristics. 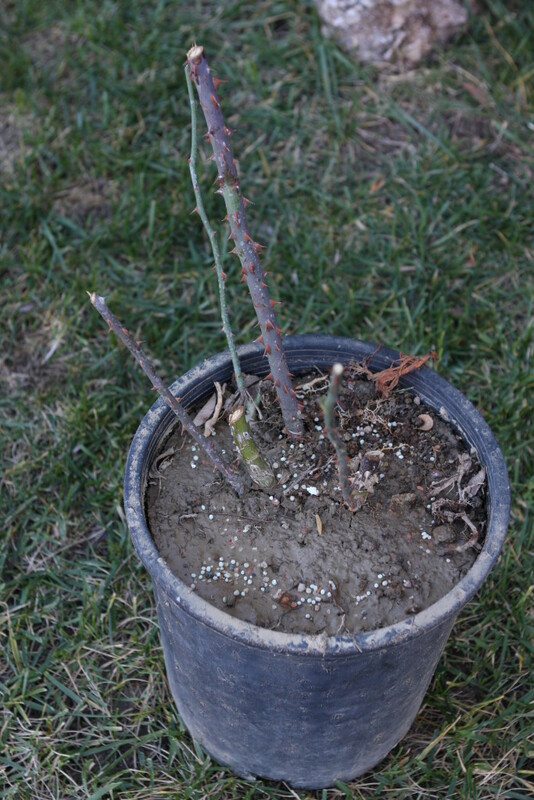 Generally, pruning occurs after the threat of frost has past. Left alone, the plant will bud when the weather begins to warm. However, pruning stimulates the plant to bud. If there is frost, the buds will be damaged. Here in Zone 10, January is generally accepted as the ideal time to prune. There is not a lot for me to prune this time around other than the roses. 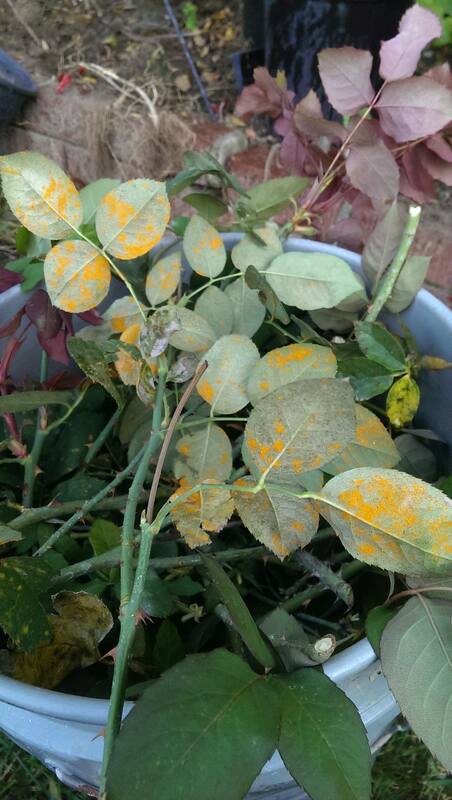 Upon the task, it was discovered that the roses had orange fungi (aka ‘rust’) on them. Since the roses were to be pruned all the way back to just the branches, I was not overly affected. As for how the fungi go on there, it was related to the week of down pour. Fungi spores are everywhere in the dirt. With the rain drops reaching the dirt at terminal velocity, the spores are sent upward by the resultant force. From the lower part of the plant, the fungi make their way upward. The best recourse is to spot the affected areas early and remove them with care. Literally carefully handling. The affected area(s) needs to be disturbed as little as possible so as to prevent the spores from being dispersed. 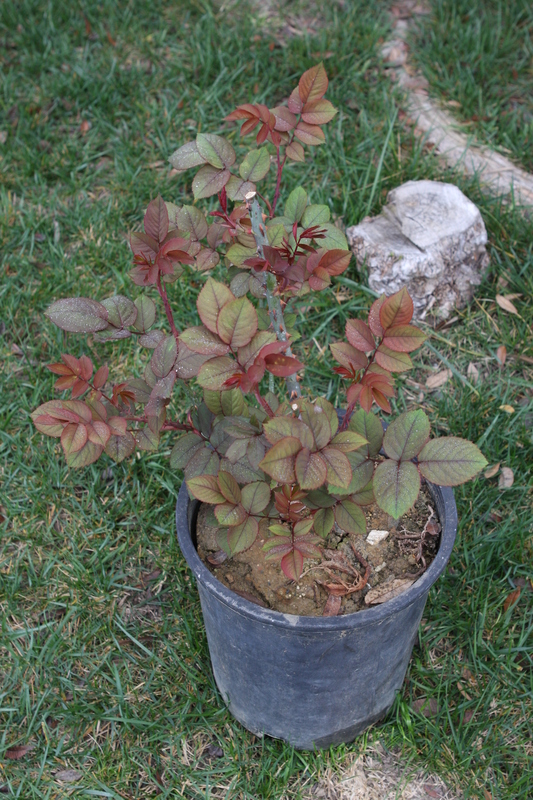 The same care is needed once the affected parts are cut from the plant. Dispose of into the refuse container. The trimmed parts need to go into the refuse container; and not into a compost pile. This Mr. Lincoln rose was received bare rooted last April. The plan was to put this Mr. Lincoln rose into the ground on this day. However, it was decided that it might be better to allow it to hang out in the pot for a bit longer. Though I have found that roses are like weeds. As long as the root is present, it’ll grow. Pruning does not magically turn the weather warm so we impatiently wait some more. 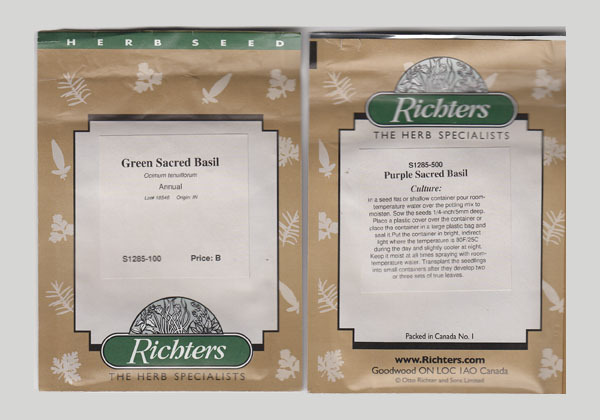 During this time we go over our seed inventory, check the plots in the garden, and plan out what we will be growing. All the while, we have our eyes out for new plants to try. This is the period when restraint is often times difficult to practice. 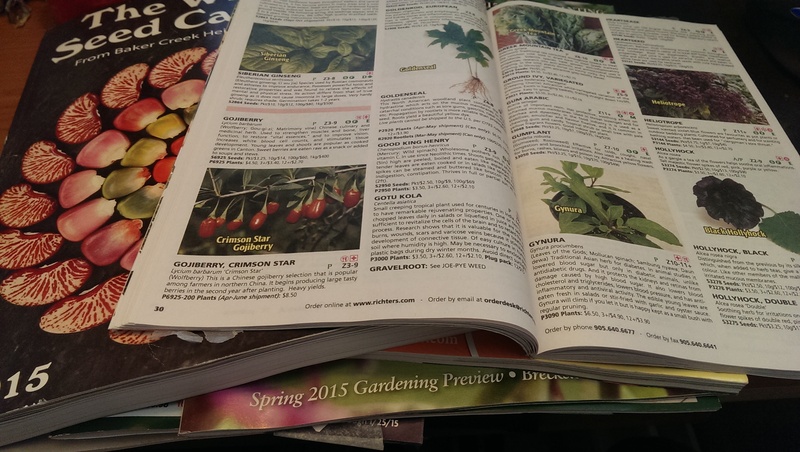 Going over the many seed and plant catalogs while not wanting to purchase more than the dirt we have for them is difficult. 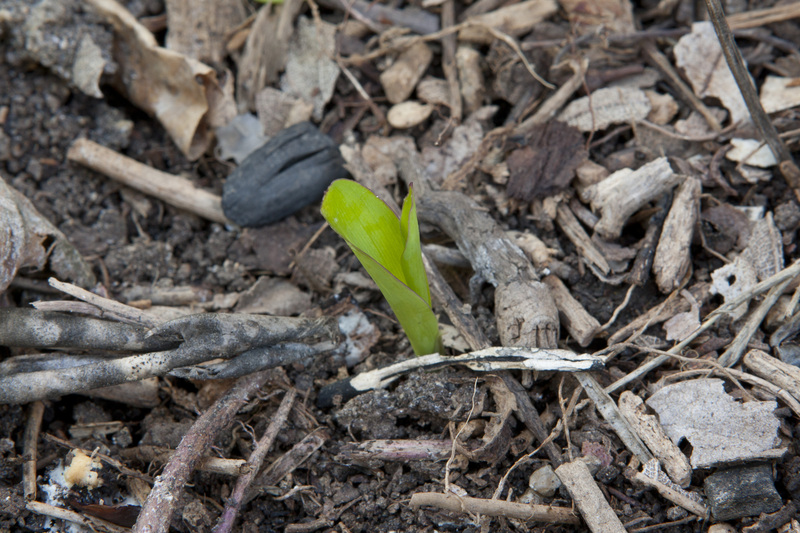 There will always be a new plant to try to grow and each new season is an opportunity to satisfy that urge. 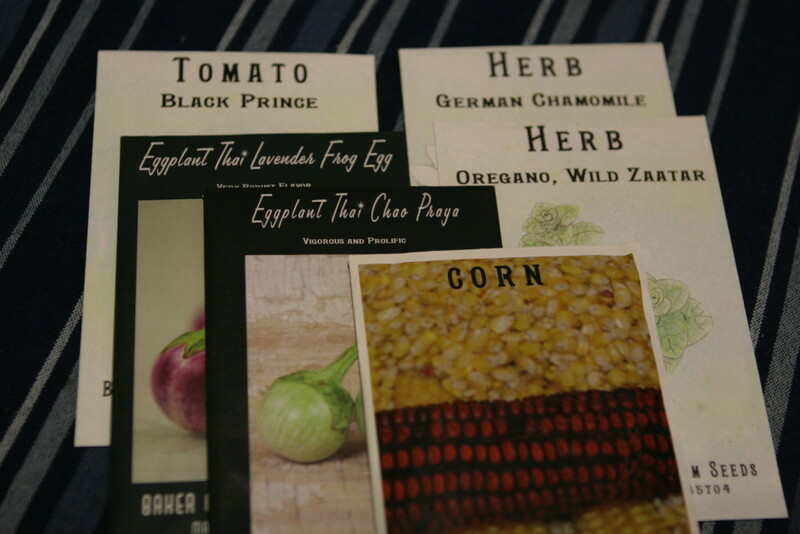 The fun is in deciding on what new plant or plants to grow. Last year I learned of Holy Basil but also discovered later on that I was growing the wrong variety. Now I have the seeds of the variety basil that is also known as kra pao. It’s the variety of basil used in traditional Thai dishes. This year I have many goals with the garden. One of them is to grow enough corn to last me through the year without having to buy corn from the supermarket. The other is to grow more of the ingredients that make green curry. 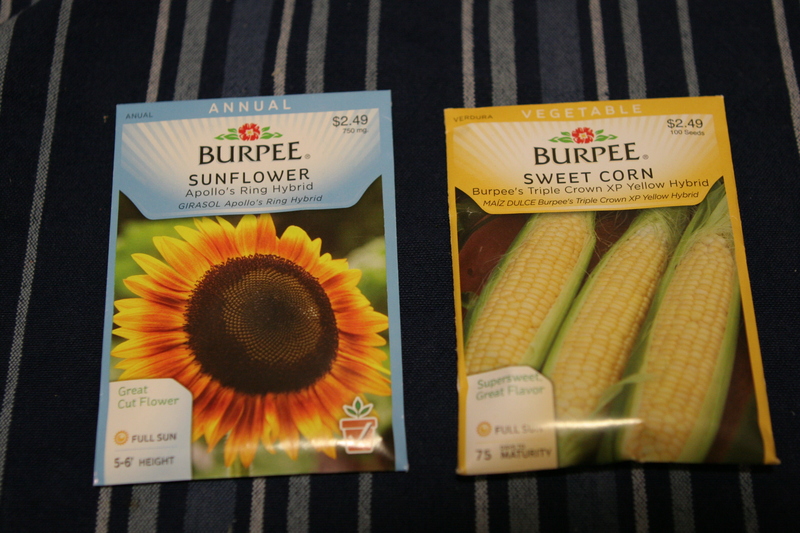 With the corn, I am curious to know the yields and taste between heirloom and hybrid varieties. To maximize the growing season, I selected the ‘Dorinny Sweet’ heirloom corn for its cool climate characteristic. The Dorinny Sweet heirloom sweet corn sprouted after about a week and a half.